A traveller takes a journey through the vast territory of Siberia, recording his observations on its people and places, wildlife and culture. The travelogue began as a literary form, dating back as early as Pausanias’ Description of Greece in the 2nd century AD, and popularised in the eighteenth century and nineteenth century by writers such as Samuel Johnson (A Journey to the Western Islands of Scotland, 1775), Alexander von Humboldt (Personal narrative of travels to the equinoctial regions of America, during the years 1799-1804), Mark Twain (The Innocents Abroad) and Robert Louis Stevenson (Travels with a Donkey in the Cévennes, 1879). Interweaving facts, observation and anecdotes, these first person accounts set the tone for much of what was to come. A more direct form of travel storytelling began in the late 19th century when American writer, John Lawson Stoddard, began giving public lectures across North America about his travels, accompanied by black and white lantern-slides printed from his photographs. These lectures proved immensely popular, encouraging others to follow in his footsteps. One was Stoddard’s protégé and successor, Burton Holmes, who first coined the term ‘travelogue’. Initially Holmes’ travel lectures, illustrated by slides, proved only modestly successful, but when he began to supplement his talks with motion pictures, their popularity soared. For sixty years, Holmes was America’s most famous travel showman. By the end of his life, he had given over 8000 travelogue lectures in cities across America. One of the most celebrated of early filmmakers, the explorer and ethnographer, Robert Flaherty, pioneered the first travel documentaries. His feature-length Nanook of the North (1922), which captured the struggles of an Inuk man named Nanook and his family in the Canadian Arctic, was a cinematic landmark. The film’s mix of fiction-film-style narrative and poetic treatment proved a hit with both critics and viewers, inspiring Flaherty to make further films in the same mode such as Moana (1926), Man of Aran (1934), and Louisiana Story (1948). Flaherty provided a template for others, usually more prosaically, to follow. Amongst the most successful were André de la Varre and Carl Dudley who both made numerous travelogues for cinema exhibition in the 1930s, 40s and 50s. From the mid-1950s onwards, travelogues become a staple of television schedules, helping to drive the then burgeoning tourist boom. This potted history of the travelogue is an attempt to put in to context the genre that Chris Marker would adopt and make his own from the 1950s onwards. As a seasoned travel journalist and former editor of the magazine series Petite Planète (Small World), Marker was already well versed in the conventions of the travelogue when he made his first foray into the field with Dimanche à Pékin (Sundays in Peking, 1956). In this twenty-two minute short, Marker took the essential elements of the genre and adapted them to suit his own philosophical interests and aesthetic style. Crucially, this meant, as critic André Bazin was the first to point out, the image was subordinate to the commentary, and the authorial voice highly individualised. It was Anatole Daumon of Argos Films, the producer of Alain Resnais’ Nuit et Brouillard (Night and Fog,1956), who commissioned Chris Marker to make a film about the vast, little-known land of Siberia. Accepting the challenge, Marker put together a team that comprised André Pierrard (executive producer), Armand Gatti (documentation) and Sacha Vierny (camera) and set off for the country in August 1957. At the time Siberia was viewed in the West as a forbidding, windswept wasteland, where opponents of the Soviet Union regime were locked up in gulags. By contrast, the Soviet propaganda machine portrayed this largely undeveloped region as a workers’ utopia. From the evidence of the film, it is clear that Marker’s intention was to avoid both these stereotypes, and to present instead, the country as he encountered it – a place of charm and wonder, with its own unique customs, culture and wildlife. As a way, perhaps, to distance his narration from the overly earnest commentary of most travelogues, Marker adopts an epistolary approach to the written narrative spoken by Georges Rouquier. Thus each thematic chapter of the film begins: 'I'm writing you this letter from...’. This method connects Marker with a long tradition of eighteenth and nineteenth century French explorers writing letters home from their expeditions, and allows him an intimacy that flows naturally in personal correspondence. His Siberia is a place of myth and legend with its own singular tradition, and a landscape rich in natural wonders, where, if you ‘follow the wrong trail you may come to a bear or a tiger’, or even the frozen remains of a mammoth. These latter beasts, the narrator informs us, were believed by the ancient Siberians to be giant moles when their preserved corpses emerged after the thaw. A lighthearted animated sequence illustrates how this happened, and how they were later rediscovered by curious scientists – a stylistic digression, perhaps, but an informative one, and considering the often playful narrative, all of a piece with the whole. To convey a sense of the scale of Siberia, Marker contrasts and compares the country with other places in the world. So, for instance, we learn the great Siberian river, the Lena, is ‘five times as long as the Seine and fifty times as wide’. Extraordinary statistics like this bring home the sheer size of the territory: a land of extremes where winter temperatures can reach lows of-60º C, and climb to 40ºC in the summer. Yet, never once does he portray the country as forbidding, or the people as inhospitable. On the contrary, the verdant countryside and friendly locals we see in the film might encourage even the most skeptical to visit. Certainly nobody could help but be charmed by Ushatik, the talkative bear, rescued by one Boris Sergeivich from the forest and now an adopted member of his family, or the reindeers upon which the Arctic people’s economy depends. ‘You could go on praising the reindeer forever,’ the narrator declares, as he imagines an advertisement selling this most versatile of animals to the housewives of Moscow, Rome, New York, Peking or Paris. Letter from Siberia’s best-known and most celebrated sequence has often been cited as an example of how commentary can alter our understanding of what’s on screen. Three times Marker shows the same footage – a shot of a bus passing a car on a city street, and another shot showing workers paving a road – but each time the footage is interpreted a different way by the narrator. The first version is unequivocally positive, the second emphatically negative, while the third version is entirely objective. Each iteration represents a viewpoint that could be characterized as pro-Soviet, anti-Soviet and ethnographically objective, demonstrating the impact a commentary’s slant can have over the images it describes. Even the objectivity of the third version is questionable, the narrator points out, because, although it may not distort Siberian realities, it nevertheless artificially isolates them long enough to be appraised, and consequently distorts them all the same. A better way to understand Siberia, Marker suggests, is to listen to Siberian expressions ‘that are already pictures in themselves’. Phrases such as ‘the season of dying water’ (winter) and ‘the ghost of the winter hare’ (snow) tell us more about the true nature of the people who created them than an outsider’s observations ever could. In Marker’s world, poetry always carries more weight than prose. Even underground, the film reveals, Siberia is a place of wonders. Below the frozen tundra there are man-made caves where scientists of the Low Temperature Research Institute preserve flowers while studying the resistance of ice to stone and metal. One day, they believe, man will find hospitality beneath the surface of this hostile land. ‘Like all Russians, they’ve read Jules Verne,’ the narrator observes, ‘and are getting ready for the journey to the center of the Earth.’ Five years later, Marker himself would make his own foray into science fiction with La Jetée (1962), and it’s easy to imagine that the subterranean world he invented for that film was inspired by his experiences here. Back on the road, Marker and his team stop off in Aldan, a rough and ready frontier town at the centre of the once lucrative Siberian gold rush. Like its North American equivalent in the Yukon – a comparison Marker underscores by adding old-time American music to his images – this town attracted prospectors from all over, who arrived by steamship, or aboard the Trans-Siberian train. As the narrator recounts: ‘There were gunmen on the roads, smugglers in the towns, and gold dust would change pockets whenever someone quick on the draw met someone quicker. In short, you had all the ingredients of a Western.’ Today there are still a few lone prospectors who ‘shun organization and security’, and pan for gold the old-fashioned way. ‘Tolerated at times, outlawed at others, they live in the wake of the dredges like gleaners on the heels of harvesters.’ One senses Marker has a fondness for these rugged individualists; perhaps because their cantankerous attitude reminds him of his own determination to work outside the mainstream film business. 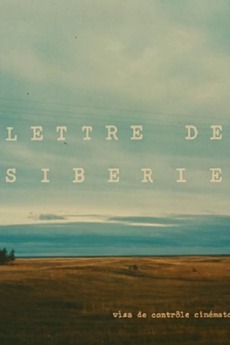 Letter from Siberia is an essay on the reality of Siberia past and present in the form of a filmed report. Or, perhaps, to borrow Jean Vigo’s formulation of À propos de Nice (“a documentary point of view”), I would say, an essay documented by film. The important word is “essay,” understood in the same sense that it has in literature — an essay at once historical and political, written by a poet as well. As so often, Bazin shows his brilliance as a critic, as he isolates precisely what distinguishes Marker’s approach from that of other documentary filmmakers. In the tradition of the great literary essayists, Marker enriches our understanding of his subject through the sheer breadth of his erudition, yet never once is he condescending in his descriptions of the people he encounters. On the contrary, one feels what interests him most is what he, and we, can learn from them. This quality is the essence of his genius, and the reason Letter From Siberia is still essential viewing today.